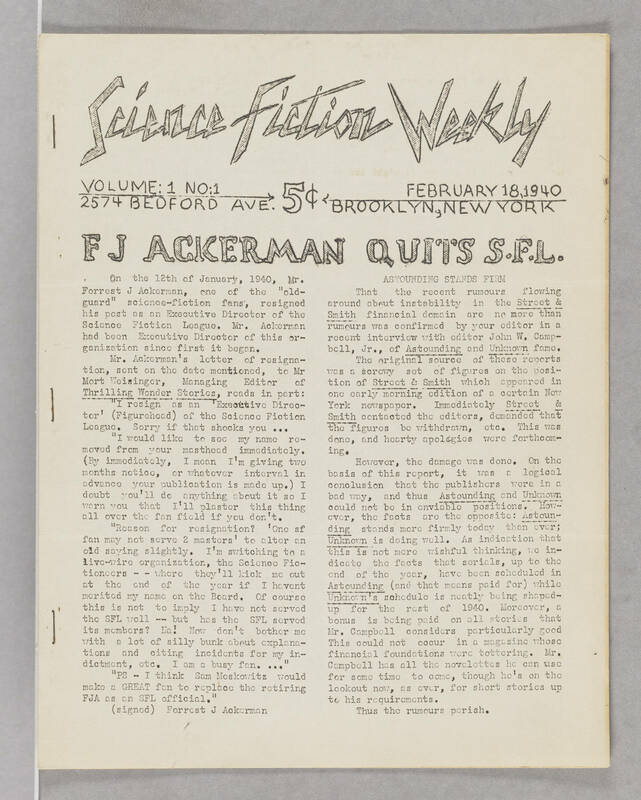 Science Fiction Weekly Volume 1 No: 1 2574 Bedford Avenue 5¢ February 18, 1940 Brooklyn, New York F J ACKERMAN QUITS S . F . L. On the 12th of January, 1940, Mr. Forrest J Ackerman, one of the "old-guard" science-fiction fans', resigned as an Executive Director of the Science Fiction League. Mr. Ackerman had been Executive Director of this organization since first it began. Mr. Ackerman's letter of resignation, sent on the date mentioned, to Mr. Mort Weisinger, Managing Editor of T̲h̲r̲i̲l̲l̲i̲n̲g̲ ̲W̲o̲n̲d̲e̲r̲ ̲S̲t̲o̲r̲i̲e̲s̲, reads in part: "i resign as an 'Executive Director' (Figurehead) of the Science Fiction League. Sorry if that shocks you ... "I would like to see my name removed from your masthead immediately. (By immediately, I mean ! 'm giving two months notice, or whatever interval in advance your publication is made up.) I doubt you'll do anything about it so I warn you that I'll plaster this thing all over the fan field if you don't. "Reason for resignation? 'One sf fan may not serve 2 masters' to alter an old saying slightly. I'm switching to a live-wire organization, the Science Fictioneers - - wvhere they'll kick me out at the end of tho year if I haven't merited my name on the Board, Of course this is not to imply I have not served the SFL well — but has the SFL served its members? Ha! Now don't bother me wlth a lot of silly bunk about explanations and citing incidents for my indictment, etc, I am a busy fan. ..." "PS - I think Sam Moskowitz would make a GREAT fan to replace the retiring FJA as an SFL official." (signed) Forrest J Ackerman ASTOUNDING STANDS FIRM That the recent rumours flowing around about instability in the Street & Smith financial domain arc no more than rumours was confirmed by your editor in a recent interview with editor John W, Campbell, Jr., of Astounding and Unknown fame. The original source of these reports was a screwy set of figures on the position of Street & Smith which appeared in one early morning edition of a certain New York newspaper. Immediately Street & Smith contacted the editors, demanded that the figures be withdrawn, etc. This was done, and hearty apologies were forthcoming. However, the damage was done. On the basis of this report, it was a logical conclusion that the publishers were in a bad way, and thus A̲s̲t̲o̲u̲n̲d̲i̲n̲g̲ and U̲n̲k̲n̲o̲w̲n̲ could not be in enviable positions. However, the facts are the opposite: A̲s̲t̲o̲u̲n̲d̲i̲n̲g̲ stands more firmly today than ever; U̲n̲k̲n̲o̲w̲n̲ is doing well. As indication that this is not mere wishful thinking, we indicate the facts that serials, up to the end of the year, have been scheduled in A̲s̲t̲o̲u̲n̲d̲i̲n̲g̲ (and that means paid for) while U̲n̲k̲n̲o̲w̲n̲'s schedule is neatly being shaped-up for the rest of 1940. Moreover, a bonus is being paid on all stories that Mr. Campbell considers particularly good. This could not occur in a magazine whose financial foundations were tottering. Mr. Campbell has all the novelettes he can use for some time to come, though he's on the lookout now, as ever, for short stories up to his requirements. Thus the rumours perish.